Skateparks are for everyone! is the guiding principle of Betonlandschaftens. We resort to long term experience in designing skate- and bikeparks with many successful projects around the world. The team is rooted in the scene and incorporates a wide knowledge of the sport and its requirements towards park design. This gives us a good understanding of all the various disciplines to build upon. 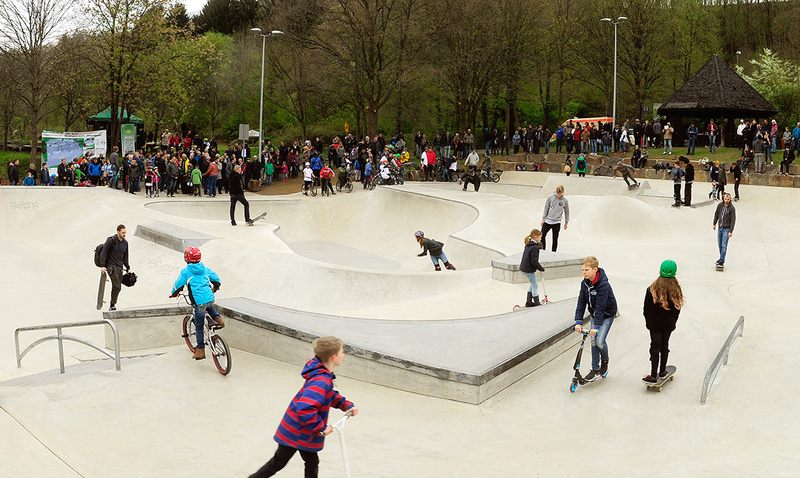 As the only landscape architects in Germany specialised on action sport facilities we especially understand how to mediate between these demands and those of public authorities. As public space and sports facility, a skatepark is available for everyone. They should therefore be equally attractive for skaters, BMXers, scooters, inline skaters, dirt bikers and many other athletes with various ages and skill levels. Inclusion is a highly valued and discussed principle of our modern society. We would like to contribute to that by breaking barriers between the users. That is why we design our parks in a way that makes them suitable for everyone. Because every sport is different, it has somewhat unique requirements to a park, while the fundamental concept behind each discipline is rather similar. The basis behind them is individual development and creative use of the present surroundings. By utilizing this aspect, we are able to cater to every need equally. Thanks to our comprehensive knowledge and good communication with all involved parties (public authorities, users and executing companies) we are able to devise a park that incorporates preferences like “Vert”-, “Street” or “Park”-skating as well as financial and topographical boundaries. Finally, this leads to positive response with everyone involved and consequently a high utilisation of the site. At the same time, we always try to give every park unique characteristics and features. Not only does this increase its recognition factor but users tend to identify more with the park which results in a positive perception by the public, tidier surroundings and less to no vandalism. We are landscape architects and we align to the Fee Structure for Architects and Engineers (HOAI) when designing a skate and bike park.